Great sink and was just as it was in the picture. 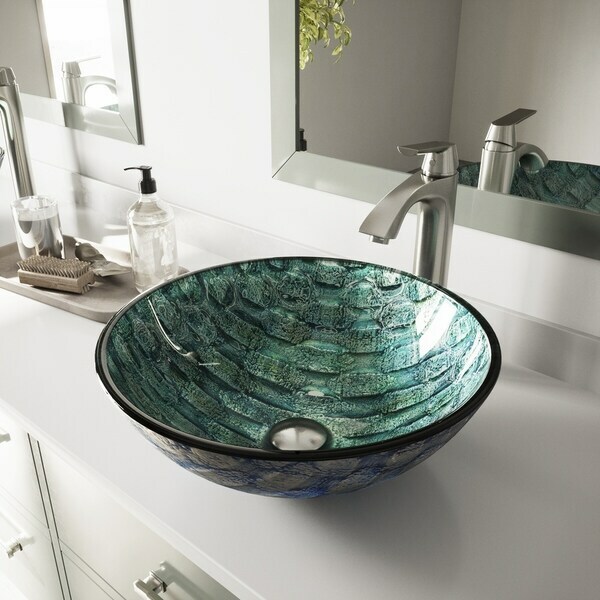 Crafted by hand with premium tempered glass, the VIGO Oceania Glass Vessel Bathroom Sink is ideal for everyday use. The polished interior and textured exterior are stain-resistant and easy to clean. The beautiful waves of tropical green and blue flecked with gold on the interior are balanced by a softer brushed pattern of lapis blue and white on the exterior. Love the sink and it looks great. The outside has a brushed blue look while the inside is a beautiful green. Outside has a rought texture which looks a little unfinished but is part of the character. Installed easy and cleans easy. I love my new vessel sink. I mounted it on a gray & white marble counter and it is stunning. Very pleased with the service, the well-packaged item which arrived safely, and of course, the beauty of the item. It is very well represented in both color and detail by the image online. it is beautiful. Easy to install. The sink is beautiful. The outside is a much brighter blue than the inside which is what we wanted, but make sure that works for you. We've had it a year using it in a commercial setting, and is has held up very well. It came packaged well and it is beautiful! It will work perfectly with my ocean themed bathroom! It's a beautiful that accents my bath. Good price. But I was so crazy about it i ordered it 5 months before my new home is built! The picture and description seem like what I want. The price seems reasonable. "how big is this sink? it only mentions a range of sizes,,, can't tell if it is 25 diameter or smaller." Hello shulir, this is approximately 6"H x 16.5 inches in diameter and approximately .5 inches thick. Thanks for shopping with us!